June Book of the Month! If you haven’t already heard – The Trail has partnered up with the Book Exchange to bring our monthly Book Club back to life! Each month we’ll be bringing you a new book to digest and then pointing you to their Facebook page where you can learn more and discuss it with others. 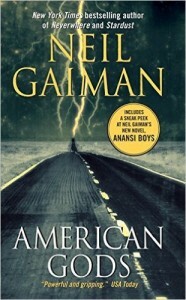 This month we’re reading Neil Gaiman’s award-winning novel, American Gods. A fantastical blend of Americana, fantasy and both ancient AND modern mythology, American Gods details an epic showdown between the gods and spirits of yesterday with new ones that reflect our obsessions with media, celebrity, technology, drugs, etc. Buy a discounted copy of American Gods all month long at the Book Exchange, and while you’re there check out their amazing collection of new and used books and enjoy a nice, quiet read in their lounge!